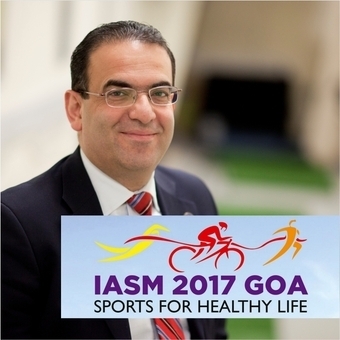 Professor Rami Abboud, Associate Dean for Learning and Teaching and Head of Postgraduate Division, School of Medicine, was invited keynote speaker at the 38th annual conference of the Indian Association of Sports Medicine (IASMCON 2017), held in Goa between 17th and 19th February 2017. Professor Abboud’s keynote talk was very well received as he shared his vast knowledge of biomechanics in sport to an audience of physiotherapists, coaches, sports medicine students and orthopaedic surgeons. Dr Graham Arnold and Mr Sadiq Nasir accompanied Professor Abboud to support and assist at the symposium in their capacity as experts in the fields of motion capture and gait analysis at the Institute of Motion Analysis & Research (IMAR), University of Dundee. They presented a mini workshop about setting up a gait laboratory, albeit virtually as no equipment was available to be delivered on time by Vicon, within the conference hall and demonstrated the process of data collection through to analysed results. The workshop was extremely well received to the extent that many delegates thought there were cameras set up around the conference hall and force plates embedded in to the stage floor. “Both Graham and Sadiq prepared this workshop, practiced rigorously and executed it to perfection, which is why it mesmerised the delegates for the entire 45 minutes. Credit to both of them in making this virtual workshop almost real - it is a shame I did not have a video camera to film it as it was impressive”, said Professor Abboud. Dr Arnold and Mr Nasir also manned the University of Dundee stand providing information on the postgraduate courses run by the School of Medicine and the University as a whole. The stand was extremely busy with many enquiries regarding IMAR’s facilities and the courses run at the School of Medicine. During the conference Professor Abboud met up with a previous Sports Medicine student, Rucha Kashalka, who graduated from the University of Dundee in 2014 and was Sports Physiotherapist with the Indian female wrestling team for the 2016 Rio Summer Olympics. “It was a great privilege to be invited by the President of IASM for the second year running to attend this prestigious sports conference. This year was extra special as the new President is one of our MCh (Orth) graduates from 2003; Dr Parag Sancheti” said Professor Abboud. This year’s conference provided orthopaedic surgeons, physiotherapists, sports coaches, sports scientists, and physical trainers a platform to interact, learn and share knowledge and skills, and to build collaborations towards long-term professional support. The Institute of Motion Analysis & Research conducts regular cutting-edge sports-related research studies each year on various undergraduate and postgraduate degrees including the Master’s degree MRes in Sports Biomechanics & Rehabilitation.